This weeks tip is about clean brushes. When you apply your make-up it is good to have clean brushes. You need to clean them every once in a while because they can get very dirty. And I’m not only talking about the make-up that gets into them, but also bacteria. When using your brushes oil, bacteria and dead skin can end up in your brushes which can make that your skin can get clogged up and you can get infection which can cause breakouts. It is important to wash them regularly, best once a week. I don’t use make-up daily, so I don’t use my brushes on a daily basis, therefor I try to clean my brushes every two weeks. I did a before and after of 2 of my brushes I use. And you can surely tell a difference. 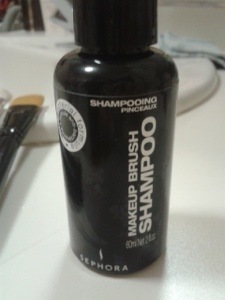 I use a makeup brush shampoo from Sephora. There are other brands that have a similar brush shampoo, but you could also use a baby shampoo or a mild clarifying shampoo. Here are some easy steps for cleaning your brushes. 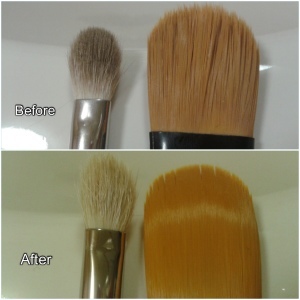 First you want to rinse out all the excess make-up that is in your brushes. You can do this by running your brushes under lukewarm water. After that you can put some shampoo on your hand, and you just swirl the brush in the palm of your hand. Then you can gently squeeze it out. Or you can fill a bowl (or your sink) with lukewarm water and the shampoo, and then you can clean your brushes by swirling them in the water. After that you can rinse the brush holding it under lukewarm water. You want to repeat the shampooing and rinsing step until the water is clear. You can use a paper towel to dry your brushes with, and after that you can lay them down to dry further. Come back next week for the last thursday summer beauty tips! This entry was posted in beauty and tagged beauty, clean brushes, tips by missnathaliexo. Bookmark the permalink.